We’d love your help. Let us know what’s wrong with this preview of Flesh & Wires by Jackie Hatton. It’s summer on the Connecticut shore, sometime in the not-too-distant future. The invaders have been and gone, taking most of civilization with them. All that remain are scattered groups of women survivors, their skin speckled silver with alien implants. Most of them are too broken to do more than just survive in the encroaching wilderness. A strong few use the power cours It’s summer on the Connecticut shore, sometime in the not-too-distant future. The invaders have been and gone, taking most of civilization with them. All that remain are scattered groups of women survivors, their skin speckled silver with alien implants. Most of them are too broken to do more than just survive in the encroaching wilderness. A strong few use the power coursing through their alien wires to flourish, to rebuild. In the community of Saugutuck the women have slowly created an oasis of civilization. The only thing missing is any kind of certainty about their future. Will they live, will they die, will they ever bear children? Some of them care. Others not so much. Some of them still miss the men. Others not so much. Lo is one of those others. To ask other readers questions about Flesh & Wires, please sign up. So much fun to read sci fi for adults that features people with complicated emotional lives in situations that do not have fairy tale plotting. In this book, women talk to each other about more than men. They deal with power, colonialism, and a post-apocalyptic world in a fascinating and nuanced manner. Hatton drew me into the story from the first page. 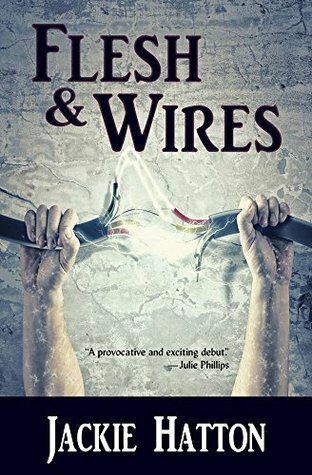 Flesh & Wires is exciting and thought-provoking with a cast of memorable characters, each distinctly drawn. The story is about survival, adaptation, and protecting one’s own. Lo, the protagonist, is suffering from PTSD. She’s been fighting so long, she doesn’t know how to stop or even if she should. The novel kept me turning the pages, and I missed some sleep. I hope Hatton will write us a sequel. The story is set in Connecticut, thirty year Hatton drew me into the story from the first page. Flesh & Wires is exciting and thought-provoking with a cast of memorable characters, each distinctly drawn. The story is about survival, adaptation, and protecting one’s own. Lo, the protagonist, is suffering from PTSD. She’s been fighting so long, she doesn’t know how to stop or even if she should. The novel kept me turning the pages, and I missed some sleep. I hope Hatton will write us a sequel. The story is set in Connecticut, thirty years after the destruction of present-day civilization by aliens. Before their demise, the aliens enslaved some of the women and wired them, giving them exceptional strength and telepathic powers, while rendering them infertile. Lo’s community of mostly women survivors (both wired women and "naturals") has managed to establish the safe haven of Saugatuck, which must be vigilantly guarded. Once again, the survivors are threatened by aliens, this time by a colonizing expedition and a band of refugees. Are the aliens dangerous? Are they who they say they are? Some possess skills that Saugatuck desperately needs, but can Lo trust them? How can Saugatuck afford to feed and house them with only limited resources? Perhaps more importantly, can the aliens give the women natural children?--which brings me to my final comment: the scenes with the technically enhanced children are absolutely chilling. Flesh and Wires is a fun ride. Hard-hitting and fast paced, this scifi novel sets us on a rollercoaster. Aliens invade dystopian America and fragile alliances crumble as men intrude on a world run by wired women. The last time I read a work of science fiction was in college (Dune by Frank Herbert). Except when it enters my life in the form of a manuscript to critique, as this one did. Full disclosure: author Jackie Hatton and I are members of the same critique group and friends, too. Does this di Flesh and Wires is a fun ride. Hard-hitting and fast paced, this scifi novel sets us on a rollercoaster. Aliens invade dystopian America and fragile alliances crumble as men intrude on a world run by wired women. The last time I read a work of science fiction was in college (Dune by Frank Herbert). Except when it enters my life in the form of a manuscript to critique, as this one did. Full disclosure: author Jackie Hatton and I are members of the same critique group and friends, too. Does this disqualify me to review her book? I think not. One of the most painful moments in a critique group is when a writer hits a wall. It may be a total writer’s block or the utter conviction that everything you’ve ever written is crap. One of the greatest joys is to watch a writer stand up, dust herself off and go at it again. It’s been a pleasure and a privilege to watch Jackie grow as an author. And now a thrill to hold her book in my hands. Having said that, I do have a point of critique (as always!). I wish there had been time to explore the characters more deeply. There’s the heroine Lo, intrepid leader of the Saugatuck women with considerable anger issues. Her errant brother Will and his double agenda. And my favorite character, the 135 year old alien Lurch, the sexiest male ever to don a bodcoz. I can still remember the heated debate during critique. Should Lurch be given a Russian accent and, if so, how heavy should it be? Would that make him sexier or shade him into the comical? These are the kind of details an author agonizes over. "Lo wandered over and stood in front of the mirror, pulling her hair back tight to expose her taut forehead with its mottled ring of silver freckles." This is a very good debut novel and I hope Hatton produces a sequel. The central character is interesting, not always likable, but always interesting. Lo bears responsibility for making hard decisions in order to protect a small group of survivors who have been able to make a start at rebuilding a life and working society - dealing with the consequences (e.g. post traumatic stress, genetic engineering, fit for purpose physical augmentations etc) after having been enslaved by aliens who saw human This is a very good debut novel and I hope Hatton produces a sequel. The central character is interesting, not always likable, but always interesting. Lo bears responsibility for making hard decisions in order to protect a small group of survivors who have been able to make a start at rebuilding a life and working society - dealing with the consequences (e.g. post traumatic stress, genetic engineering, fit for purpose physical augmentations etc) after having been enslaved by aliens who saw humans as chattel to be used as they saw fit. While the central story line is well paced and there was plenty of suspense and action to hold my interest; what makes the book most interesting is the way Hatton has developed the various groups that inhabit the environs of Saugatuck CT (nice touch on location). Principally women are in charge - but not all women think the same , the various groups have access to different tech, some are driven by ideologies that are very imaginative -- and within groups the dynamics on how to meet the future is very, very different. An interesting plot line is what the aliens did to the women's reproductive capabilities and to a set of surviving children (no spoilers). I remained interested until the end of the book in how the different colonies/communities interacted. In this context what Hatton does well is not overly define the world or micro communities - there is enough to have context but not so much detail that the pace gets bogged down. I felt that my own imagination was engaged as I read along. The central character Lo is strong enough to carry this first novel. While several other characters are sufficiently developed I look for more in her second novel. This is a book of two halves: one good; one splendid. The splendid is the first: a real page turner with its escalating plot, its twists and turns, its gathering jeopardy. Centre stage is Lo, ageless, cybernetically enhanced, leader of a community of such women: "Flesh & Wires" in a post-apocalyptic world. We share Lo's thoughts, her plans and emotions. The narrative is a crescendo and its revelation is the Children: changed to the point of inhumanity; their gathering powers; amoral; group or This is a book of two halves: one good; one splendid. The splendid is the first: a real page turner with its escalating plot, its twists and turns, its gathering jeopardy. Centre stage is Lo, ageless, cybernetically enhanced, leader of a community of such women: "Flesh & Wires" in a post-apocalyptic world. We share Lo's thoughts, her plans and emotions. The narrative is a crescendo and its revelation is the Children: changed to the point of inhumanity; their gathering powers; amoral; group or other conscious; their disregard for the women, the few still human survivors. We have in microcosm The Midwich Cuckoos, The War of the Worlds, and something that is unmistakably Jackie Hatton. The second part explores the politics and motivations of Lo's women, the hinterland of larger settlements, two groups of alien settlers: their interaction, self interest, the motivations they ascribe one another. And this is good, and not splendid, precisely because it attempts this complexity, their misunderstandings, their selfish, limited motivations, their inability to control, to perceive, or to understand the larger picture. This of course is realistic, and therein lies its limitation. For while it deals with the accommodation of settlers and natives, and resolves this, tentatively, in the final pages, it leaves no room for the greater threat, the greater interest of the Children, their identity, their purpose: the future, brilliant or apocalyptic, they may represent. I'm at 65% and giving this a one star rating because I can't bring myself to finish it. I probably will, between books when I have nothing better to read, but this novel has become more of a task than a pleasure, and I'm pining for a good book. So far, the characters are all... eh. There isn't a single character I like, which can be a blessing in some novels, the ability to make a reader dislike someone who doesn't exist is proof of some form of writing. But all the characters here - Jo, Helena, I'm at 65% and giving this a one star rating because I can't bring myself to finish it. I probably will, between books when I have nothing better to read, but this novel has become more of a task than a pleasure, and I'm pining for a good book. So far, the characters are all... eh. There isn't a single character I like, which can be a blessing in some novels, the ability to make a reader dislike someone who doesn't exist is proof of some form of writing. But all the characters here - Jo, Helena, Will, Bob, they all leave me highly unimpressed and with the mental equivalent of a sour taste in my mouth. They irritate me. The storyline seemed so highly, highly promising, and the writing style itself is actually great, there's a perfect mix of description, dialogue and monologue, but that really just gives the entire book the feeble impression of a beautifully wrapped, shoddy gift. I really wanted to enjoy this novel, but I just couldn't get behind it. And the number of spelling mistakes is frankly unbelievable - I know no novel is flawless, but you can only skip out so many apostrophes before one starts to wonder how little heart really went into editing it. I hope that, by the time I get to the ending, I'll have changed my mind about it, I don't like leaving bad reviews, especially given that there aren't very many reviews on this to begin with, but reading shouldn't be a chore. Fantastic premise, and fantastic characters. Hardly any of them are nice, and they're all working separate agendas, leading to a story that's both interesting and complex and painted almost entirely in shades of grey. It is in fact almost uniformly excellent until it gets to the end, and the end is where it all fell apart for me. I didn't find it convincing on any level, and it kind of dragged the rest of the story down by association. Which is a real shame, but there you are. I really enjoyed this novel. It takes a world that is very familiar to me - suburban commuterland Connecticut - and completely re-imagines it as a post-apocalyptic landscape ruled almost entirely by a self-sufficient community of women. No one shops for groceries or plays golf here - they're far too busy defending themselves against hostile forces such as alien invaders and feral dogs roaming just beyond the community's boundaries. Commuting will never be the same again! I was lucky to attend a book reading at WisCon, so I was introduced to this story through Jackie's lovely accent. I had to know the rest of the story, so I bought the book that day (in time for her to sign it before the end of the convention). I just could not put the book down and can't wait to encourage others to read it. I so enjoyed this book. Amazing female protagonist. Alien invasion (I love aliens!) Dystopian world. Strong prose (very balanced, polished and enjoyable to read.) I thoroughly enjoyed the author's world and characters. If you're into science fiction, you should read this. A world ruled by powerful women warriors. Modern day Amazon tail? People that don't age and live for hundreds of years. Modern day Methuselah? I like the question this novel poses, transition from post apocalyptic to civilized. What happens in war of the worlds after the aliens all die. With some caveats. I like that the characters are flawed, I like that the system is flawed and you don't always know how. The book keeps you guessing. It is a bit crude at times but a run read none-the-less.